The Scandinavians are great nature-lovers always outdoors, whatever the weather and however much sunlight they’re getting (or not getting). Nature’s very colourful, though, which might seem at odds with the Nordic commitment to minimalist monochrome in just about everything else they do. So how to combine the two? Houseplants get an exemption because they’re from The Nature and they can’t help being colourful. It’s not their fault, they just are. As with everything Scandinavian, though, these (usually) green beauties have to earn their keep – they can’t just sit there in a minimalist, ergonomic pot photosynthesising and transpiring. If you want to add a few indoor plants to your Nordic-themed home, you’ll have to go about it properly. You can’t have anything too frilly, and whatever you choose should be good for the air, as well as your colour scheme. Orchids do need checking up on regularly, but they’re worth it as they will last for years. They’ll lie fallow for a while, but that’s because they’re getting ready for the next spectacular display. They need weekly watering and lots of sun, which is one thing Oz has that Scandinavia doesn’t. Orchids are well-known for removing carbon dioxide from the air and replacing it with oxygen – always a bonus. Go for a rubber plant. They look great – a tiny bit Marimekko, in fact – and are easy to care for. If the leaves are drooping, water a bit more, if they’re brown and dropping off, water a bit less. All that and you get a plant that removes formaldehyde from the air. Can’t be bad. Try the snake plant. It’s also known as the mother-in-law’s tongue and it’s incredibly easy to deal with. It doesn’t need a great deal of sun, or attention and you can just stick it in the corner and dole out the occasional drink to keep it happy (the comedy just writes itself). In return for these fleeting favours, the snake plant will absorb benzene, formaldehyde, trichloroethylene and xylene from the air. 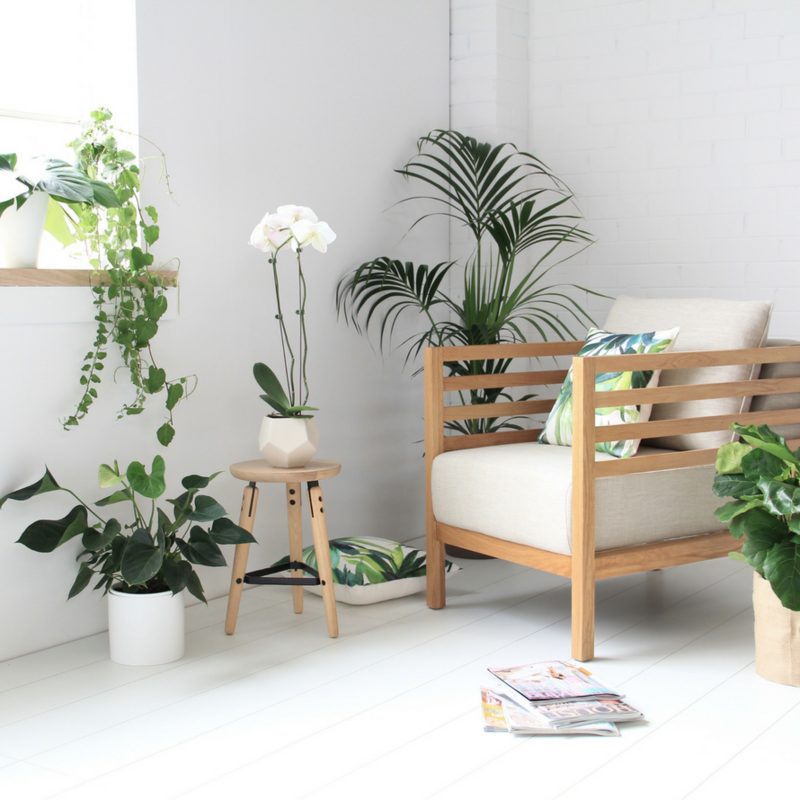 Of course, once you’ve settled on your plant of choice, you’ll have to house it in style, so choose from bare wood planters, leaded glass pyramids and stripped-down-to-the-bare-function pottery pots.